I have a quick, easy, and delicious pasta to share with you today – Meatless Monday. But first, I want to announce the winners of my little two year celebration contest. 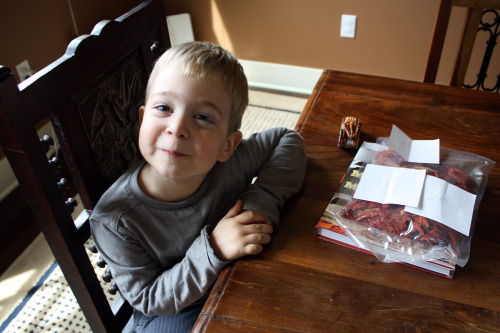 I was touched by what many of you wrote and I also got so many ideas of how to use my most special sun-dried tomatoes. I decided that I couldn’t just pick one winner, so I grabbed a couple of extra bags of those beauties and bought a couple extra copies of the book. With my trusty helper (who, in turn, needed to have his trusty helper – a truck), we picked the commenters numbered #11, #25, and #39. Ladies, I’ll be sending you an email! Back to pasta. When I was a kid, my mom had a couple of standby recipes. In other words, things she would make when she was low on ingredients or inspiration. 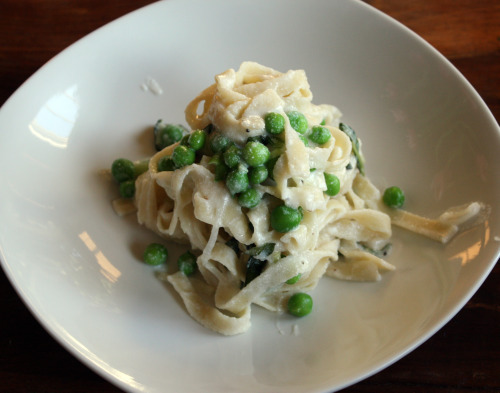 One such dish was Fettuccine Alfredo which was always a home run in our house. We all loved noodles and those long strands coated in a creamy and cheesy sauce was something that my brothers and I couldn’t get enough of. It is amazing to me, knowing what I do now, that my mom every made such a concoction. She is very weight and health conscious and Fettuccine Alfredo about as far from health food as you can get. Truthfully, I still love the taste of cream sauces but I steer clear of them. I can’t eat more than a few bites before starting to feel slightly sick – I just can’t digest all richness. 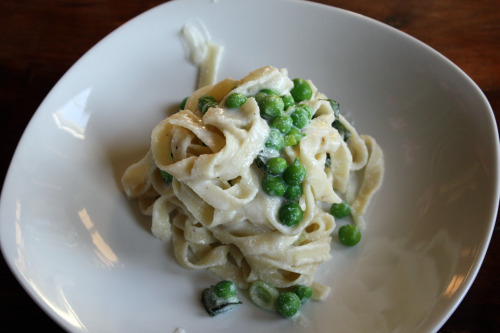 When I found this recipe for a Summery Alfredo in Food and Wine, I was intrigued. No cream, a little bit of cheese, and the starchy pasta water to bind it all together. The original recipe called for just basil, salt, and pepper in addition to the pasta and cheese, but I decided to add some goodies I had waiting in my refrigerator. Last week’s trip to the Pike Place Market brought me some spring onions and English peas, a few of which I had left in my produce drawer. I blanched the peas and sauteed the spring onions in just a tiny of bit of butter until soft. Those went into a large bowl with the two cheeses and the basil. I boiled up some fresh pasta that I had in the freezer and, using tongs, just transferred the strands directly to the bowl. I ladled in enough pasta water to create the sauce and voilà! dinner on the table in about 15 minutes. Please let me tell you how unusual it is for me to find delicacies like spring onions (which are larger, sweeter, and more mild than scallions) and English peas in my refrigerator – especially on a Sunday night after I have been gone for the weekend. Usually in that situation, my refrigerator is a wasteland where I can find some cheese, soy milk, condiments, lots of olives, and that is about it. Any hope of dinner with a fresh vegetable is a supermarket trip away. But, I had a bounty and I used it. You could, of course, substitute scallions and frozen peas in this dish. Allow the peas to thaw - no need to cook them – and just give your scallions a sauté like I did with the spring onions. Fill a small saucepan about half way full of water and bring to a boil. Add a large pinch of salt and then add the peas. Cook for 1 minute, then immediately drain and rinse with cold water. Place peas in a large bowl. Heat the same small saucepan over medium heat and add the butter. Once the butter has melted, add the spring onions and a pinch of salt. Sauté, stirring often, until softened, about 4 minutes. Do not allow to brown. Add the spring onions to the bowl with the peas. Add the two cheeses and the basil to bowl as well. Meanwhile, bring a large pot of water to boil and toss in a couple of tablespoons of salt. Carefully add the pasta and cook until al dente. Using tongs, scoop the pasta directly into the bowl with the vegetables and cheeses. Ladle out about ¾ of a cup of cooking water and toss the pasta together until the cheeses have melted and created a sauce. You may need more water if it seems too dry. Toss well to incorporate everything together and serve hot. Dana, you have a very generous soul – beautiful inside and out, for sure. That pasta dish looks lovely and I’m sure I’ll be making a version soon. That’s a cheeky wee smile from your cute little helper. Nice pasta. I am a bit like that with cream too. I do enjoy the first couple of mouthfuls, but then I start to find it sickly. Graham does enjoy a creamy sauce, so I just have a small portion. I have started adding stock to my creamy sauces as well and cutting down on the cream. They are much more enjoyable that way. It’s amazing to me how creamy that sauce is given that there isn’t actually cream in it! Alfredo sauces were my favorite of a kid, but now I steer clear. This whole “my body is a temple” thing. All that saturated fat – not worth it. This though. This I like. So! Excited! To! Win! Thank you kindly. 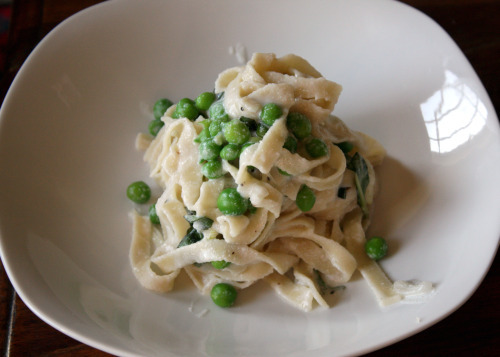 And I have all of the above in my fridge waiting to be used- I will be making this pasta soon. Thanks. Easy weeknight suppers are what I am always trying to find! This looks delicious, and might be a winner with all the boys, big and little:) Never an easy thing to accomplish. We adults don’t like cream sauces at all, but this one does look nice and light. Love the fresh peas, always so delicious. Will be making it soon. Thanks! I LOVE alfredo, but I’m always afraid of the calories. Thanks so much for this healthy alternative. Looks fantastic! Alfredo was something my mom often made when we were growing up too. But unfortunately unlike you, I don’t feel sick after a few bites and want to eat giant bowls of it! ;) This version of alfredo you posted sounds delicious.